Wakanda Forever, the long awaited. I watched it with my peeps. It was a treat, my peeps are cooler than yours. The worst part was only one person was a committed follower of the Marvel series. That just means some of us, I won’t say who, kept on asking who that random guy, Captain someone or is it Dr. Someone was? You will get upset again when you read this, yes YOU. We were in agreement with the gals though that M’baku and T’Challa were ooooh so handsome…. Black Panther was really dope for me, I wish I could have some vibranium at my backyard. My gal Jo, was my valentine. I am telling you she sent me a bouquet of flowers and a beautiful hamper. So loved and spoilt. I might have blushed. And yes, I had to give the husband an explanation lest I was chujwad😂😂. He later took me out. On the parenting front, I was beginning to think about a new school for Nate. Something was off with his school, he had gotten totally disconnected. The teachers were changing so often, I once asked him his teacher’s name and he didn’t have any clue. Not good. The red Subaru, yes I am happy to listen to all you haters after this. Well, apparently it had spark plugs for a Rav 4. I won’t sit here and pretend that I would have even know them if they were handed to me now but the man verified, I promise 😂😂😂. It was quite an active month, I was happy. I remember that. I was in a good place. January was the usual, longest month, sun so hot I got the opportunity to rock my chiffon tops and sassy dresses. Of course, I sometimes had a light sweater coz I am conscious of my arms and mummy pouch, it’s still my excuse despite my daughter being 2.6 years old. I digress. This was an inspiring month for me coz my nanny’s daughter, Cecilia got to join form one. It was a special thing to me, because her mum did not think that she would get to high school a year back, finances and all. God’s grace was sufficient as Ritings and I were enabled by God to make it possible. I remember seeing her picture in uniform and feeling so proud. This was when I did my first newspaper interview, it’s the picture here. This was a bitter sweet feeling as it was the first time I was talking to someone I didn’t know about Hubby getting sick. Did I shed a tear? Yes I did, actually two and a half, nothing wrong with crying. My interviewer was a very nice lady called Jacqueline, who took it at my pace, listened really keenly and was a gentle soul. I was grateful for that. The article came out two weeks later, of course a couple of things omitted, I understood it had to be edited though as the number of words must have been approved. It also reminded me of being part of media training, where you are taught that you can not be in control of what comes out. The one thing I wish I did better, was dress up for that picture, then again this was just the first interview, I will look dope moving forward. Yes, I anticipate doing many more interviews. I will live my dreams and impact the youth. Clearly the notion of having utensils for visitors still remains, passed down from generations. I bought cups, while taking my lovely cousin utensils’ shopping. Who shops in January?? I also don’t know. The point is, we are now in December as I narrate this story. Those cups are in the box I stored them that last week of Jan. The next person who comes to visit me, kindly demand to use those cups. You are a visitor in your own right. My sister went to high school, so enthusiastic with a little fear that she tried really well to hide. I consoled her because my folks were sweet talking and so encouraging to her, as opposed to me who was told I would go to the school I had been called to, no discussion. Being a last born is so dope. My dad turned a year older, and he doesn’t discuss his age. If you have met him though, he looks 20 years younger than he really is. Oooops, did I let the cat out of the bag? Yap, that’s what I remember about January Revs the Subaru…. I am on a journey to proper self discovery. I say proper because I am being shaken and transformed in an interesting way. Things that would never be within my radar are now what I consider doing. A few months ago, I went to Two Rivers, sat in a restaurant and spent the next three hours reading a book. Don’t roll your eyes, I am for real. It wasn’t ever in me to hang out with myself, my company wasn’t attractive, at least not to me. What do you guys see? 🤔 The beginning of this season started when my hubby was sick (story for another day). It has grown in me for sure and currently ME TIME is something I crave and absolutely love and enjoy. I won’t bore you with the details, it’s just all about me. Anyway, I have been running from writing and I have no idea why. Procrastination is another horrible habit that I have. You are welcome to come help with the policing. Mr. Police, right this way… So I am challenging myself for this entire month. I will write a short Instagram / blog post daily with my experience monthly, through this year. As always good and bad. Its part of She Life Xperiences that I hope will encourage one, two or seventy seven humans, make you shed a tear, maybe laugh out loud or just get you reflecting. Most teens in urban areas are extremely conversant with technology. Ask me, my younger sister was born in 20** well let me just say she is a teen because she will might read this.. 🙂 They are able to use phones much better than we can. They have easier access to the lyrics of favorite songs and artists, heck they even have videos real time. Some of us would have to wait until Young Nation is published each Sunday, for us to cut out the lyrics section and stick it on our Kasuku exercise book. Most probably, it was the 32 pages one as you had to buy it from your savings. It would be placed right next to your bed, at the risk of being asked if all you do is just cram lyrics as opposed to reading. Reading then was considered the ultimate. It probably still is. From a big sister perspective, I am extremely proud of her. I celebrate her, her hard work, tough spirit and especially her belief in herself. She reminds me a bit of me with her bubbliness, loudness and the belief that she can do anything. In fact, that has given me a renewed spirit. As we grow older for whatever reason, we become more reserved, some of us, and we start doubting the belief that once had of ourselves. I know I have. So today, I am encouraged by that beautiful teen who totally believes in herself / himself and views the world as the place where they can grow their abilities and faith. For the ones who attained their desires, remember it’s easy to get to the top but maintaining it is tough. Keep at it. Put in the effort and follow your dream. In the same exam, there are other young girls and boys who are like me, when I was 13 or is 14. They feel a little or a lot disappointed that they did not make it to what they desired. Dear teens, we are gifted in different categories and talents. For some, the level of grasping is fast and simple while for others, we have to read a little more. For others, talents like playing football, singing, playing an instrument, cycling, public speaking among very many different talents come naturally. They will be others. Accept the marks but don’t let it pull you down. Let it be a motivator. When you are admitted to that high school, start a fresh. Put your best foot forward, yes in education but also in the talent you have, give it your best. Continue to believe in your dream and work hard for it. I believe in you and so do your parents, relatives and friends. Believe in yourself, it makes a difference and a big one at that. I know my audience may not be teens, but whether it’s a family member, a friend, a younger sibling, please encourage and celebrate them. Ladies and Gentleman, with that in mind, I am looking at setting up a forum before Christmas to celebrate and encourage these young ones before they go to high school. Do you have some words of encouragement, a story to share? Do you remember what you scored in KCPE? How did it make you feel? What are you doing today? In whichever field, employment or entrepreneurship. This will help them face their future with hope, self-belief and determination seeing people who have made it. Guiding them and walking with them through the journey of life. Kindly get in touch with me, click here to send me an email and let’s ensure that we make a positive impact to our upcoming generations. On a separate note and project, do you remember when we used to write letters to each other while in high school? Did you have a pen pal? I remember my grandmother would write letters to us, my cousins and I, and she would send the stamps inside the envelope so that we would not have to incur any cost of replying to her. This really helped with my writing skills, it also gave me something to look forward to while in school, especially high school, on the days we would receive mail. And yes, I mean an actual letter, hand written and put in an envelope with the receiver’s name written in calligraphy. Good old times. Anyway, we are in the process of setting up a local (by this I mean Kenyan) pen pal club, a place where our children, sisters and brothers, in high school will get to write actual letters, have pen pals. The main aim is to open up their minds, writing and communication skills to their age mates in different regions, environments, school and or counties. This will help them appreciate the various parts of our country, the magical places that each has grown around, the various sites that they have and enable them to be able to one day visit and be in the other teen’s shoes for a day or two. In addition, they will learn how to step just a foot away from that computer, tablet or phone and just do some old school writing. Maybe even have a pile of letters to show for it. Are you a parent of a teen and would be interested in growing these skills? Do you have a younger sibling or have a friend with a teen? Click here to send me your details and I will reach out you. A hearty congratulations to all the great teens that sat for their KCPE exams and may your dreams come true. Continue to work hard in both your education and talent. Above all, ALWAYS believe in yourself and thank the Almighty. You can do anything you set your mind to. 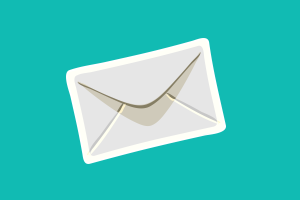 I have had such an interesting time with the crazy feedback that my friends have gotten lately from the “new craze” app Sarahah. Before I get into my perspective, clearly most people have zero chills. I have gone through the couple of messages shared by friends and people I follow on my social media platforms. Popular questions have been along the lines of whether one is dating, when they will get married, why they are not allowing others to be involved in the planning of their wedding, (the funniest one yet) among others. Then there are the comments that you should definitely marry that girl or get married by that guy (nyakua mjamaa juu kuna shortage). From this, it shows people are quite curious to know what exactly is going on in one’s personal life, with others actually giving you the statement to go ahead and marry them. My main question, is this based on our posts and shares on social media that always portray a smooth, fun life with successes, zero failures, lots of love with bae and all things going perfectly? And no, I am not excluding myself, I am in this bandwagon. For people who probably believe social media to be where their whole world revolves around, this is a dangerous angle of looking at life. I have been in this situation as well, until not too long ago. Remember the way you use a certain cooking oil because your mum used to use it. That’s not necessarily a bad thing because mums are always right, right? Munchkin 1 and 2, I already know your answer is yes. I digress. I totally understand how you would appreciate and love how someone you have admired. One who has set a certain standard for you, one who has achieved great milestones, getting themselves to become forces to be reckoned with at work, in entrepreneurship, or through their talents. I just want to challenge us to work towards greatness – Yes, BUT thrive to do things differently, instead of “I want to be just like you,” dare to follow your own path, be the best version of yourself. I have at some point in my life wanted to be like someone I truly admire and one who inspires me. And until about a year ago, I wanted to do so many things as they had done them, heck I wanted my career to grow like them, to have my own home at the age that they had theirs, wanted to do my wedding in a similar way. I actually wanted to be just like them (this might have required going round the mugumo tree seven times, If this even works, anyone tried??). They were role model, they still are! I would never have been exactly like them. I can however, be the best version of myself. Learn from others, consult, read wisely, network, travel and expose yourself to the many opportunities and experiences that are available. Be inspired by the people who you consider exemplary, successful, those who have such an organized way of doing LIFE so to speak. However, open up your mind to different ways of getting there, heck your limit can be a different type of sky. Have that uniqueness that differentiates you from everyone else. Allow yourself to move from a Copy Paste situation into your own way of getting to the proverbial TOP. As I am about to leave, the other one that this app has brought out is matters regarding depression. 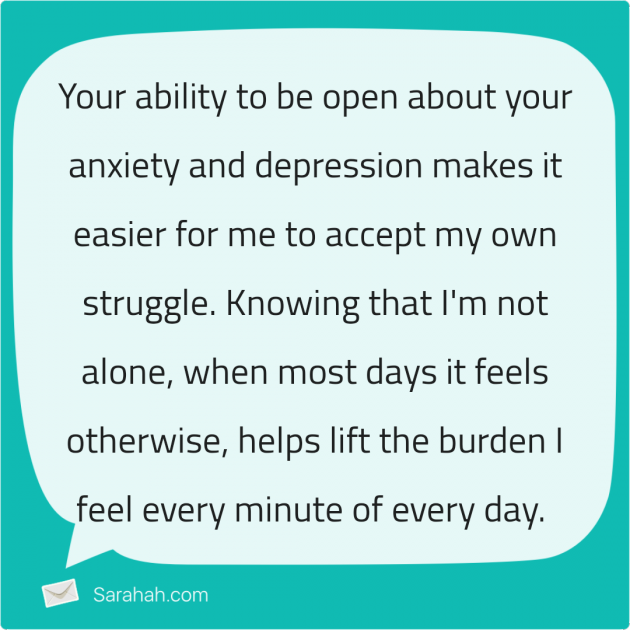 An example of a message speaking about depression. A couple of us have gotten it asked or commented about on this platform. This is a very crucial matter that I would like to join hands with friends, who would be free to speak about it,to start a sort of group, a safe space that can help. It has happened to many of us, it can get really dark, but you can also get out of it. Friends willing to partner, hit me up. Finally the day has come to introduce my princess, my munchkin 2, Papa’s lookalike, the one who made me embrace pink. I remember how I found out I was with child. I would like to say it was planned and we totally knew when it happened, but that would not be true. The smell of my colleague’s designer perfume would automatically induce throwing up. And the issue was me, not the perfume. I would not even hold anything down. It was not a surprise though, as I experienced a similar thing with munchkin 1. One of my favorite memories of pregnancy was a friendship that humbled me. I will call her Miss Star. Miss Star would offer to give me her lunch or buy me lunch as long as it meant I would eat. And more importantly, that it would stay down. In fact she would sometimes ask what I wanted the next day and make it for me. This was a time where the smell of onions was terrible. It was at her cost. And she would almost pick a stick to beat me, to ensure I finished the food. That is how my munchkin got to 2.9kilos. The best craving I had was Java fruits with yogurt. I remember the first day her dad saw her in my tummy, when he accompanied me for one of the scans. He was extremely quiet. For those who know him, he is so chatty. This brought him to silence. At the point that we knew it was a girl, he at first felt unsure. He finally spoke. And he wanted a boy. I on the other hand was totally excited. I finally saw the hair dates, dress up and girl power. But clearly I had not seen the colors. When it came to shopping, I found it a challenge as I was so used to buying boy stuff. 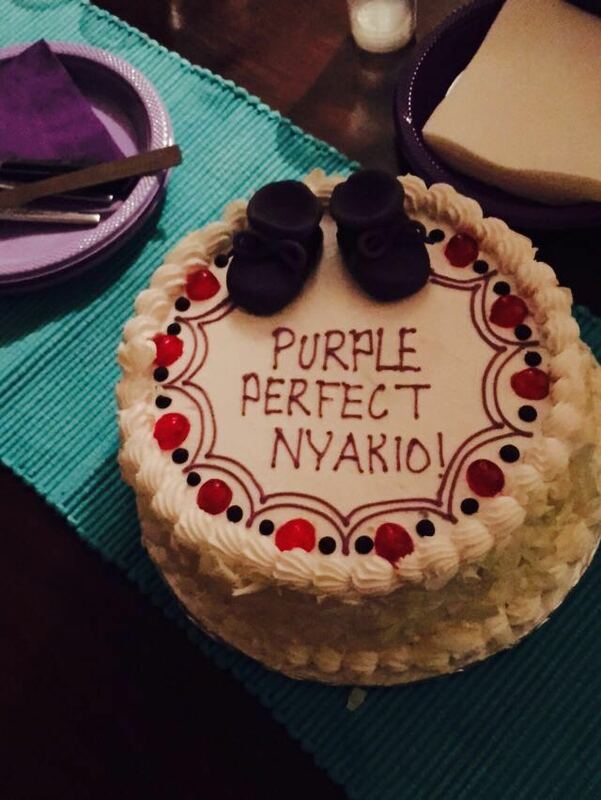 In addition, pink just wasn’t working for me, to the point that my friends got me a purple cake for my baby shower. Too cute. I digress. So back to shopping, two of my friends ensured I stayed away from blue and brown. As I continued to shop, the excitement grew and the reality of a girl finally settled in my mind. And I liked it, scratch that I loved it. Fast forward to delivery day, I was induced and felt encouraged that the second born would come out faster. Being the princess she is, she changed her position last minute and put her hand in front of her face. Don’t ask. It had to be an emergency C section. That was hard for me to reconcile with at first. I thank God it worked out because she had her cord wrapped around her neck thrice. Her father saw her first and I remember that’s where she got the nickname Papa’s look alike. And even though it’s hard to tell who the baby looks like on the first day, she did grow to be exactly that. I am so grateful for the Mister. He really helped with so much as the wound that felt like my upper body was completely disconnected from my lower body, healed. The sweetest thing was how he would come home to help bath her. And he would hold her close to the mirror, with their faces next to each other, and say for the umpteenth time, how alike they looked. He actually enjoyed doing it, other than pouring out the water from her basin afterwards, lol. The little princess had colic. She would cry and curl herself. This would sometimes drive me insane. I remember thinking I was getting depressed as I found myself feeling like I was going to put her down and walk away. This was after trying everything and she still would not stop crying. I would give her Bonnisan like it was juice. Thank fully great help from the nanny and the mister got us past it. Truly nothing ever lasts forever. Every day it went fading off until one day we realized she does not cry as much anymore. Today, I stare at a beautiful ten month old young girl, who loves herself like her dad, mum and brother combined. How dramatic she acts when she falls back on the seat from sitting to sleeping position. And especially considering it is not at all painful. I am proud as she is now getting independent. Now other people can carry her and she will not wail. She works well with out of sight, can watch cartoons, pinch her brother, laughs from deep within and has such beautiful eyes (those must be like her mum’s). She feeds really well but I have no idea where the weight goes to. One tooth is slowly popping out, but her toothless smile was so heartwarming. I will miss it. Her first word, wait for it, Baba. Did I say she eats her tongue like her mum? Ok. There we have it. Munchkin 2, the princess. In the early morning cold I couldn’t help breathing in the air and enjoying its freshness. The fact that it is a gift, that no amount is required to enjoy it, is rarely what people walking or driving to the office would think of. Sometimes, the hustles of life can make us forget that life is not guaranteed, that we are not special to be able to see this day, that it’s by the grace of the Almighty that we can walk, talk, see, hear and feel. Late last year, we went to a friend’s house to celebrate his first daughter, Shiru’s, birthday, as well as an addition to his family, his four months old second born, Jena. We had a great time at the party, children played while parents and friends caught up on their progress in life. At the end of the day, we thanked the parents for hosting and wished both girls the very best in life. On Monday last week, my friend and colleague Gerald, showed us pictures of his now eleven month old and mentioned how much she made him happy, how he loved her and how adorable she was. The gift of parenthood is so amazing, I thought as I fondly thought of my son as well. Little did we know that this was his instinct communicating a message. Two days later, his beautiful baby girl collapsed. Luckily, the nanny quickly called her mum, who wasn’t too far. She ran up the stairs and when she got into the house, one sight of her little baby girl and she knew things were bad. The mouth to mouth resuscitation, that she had been taught by a doctor, a while back ensured the baby was breathing, as a cab driver rushed them to hospital, where the father met them as soon as he could. The little one was admitted in hospital and was stabilized, but a day later her condition got worse. After analysis and scans, the doctors found that she had suffered a subdural hematoma, (a collection of blood outside the brain, under the skull), a term that I had previously only heard in medical shows. As the blood accumulates, the pressure on the brain increases. This led to an emergency surgery to drain out the blood. Baby Jena woke up well and began to take medication. 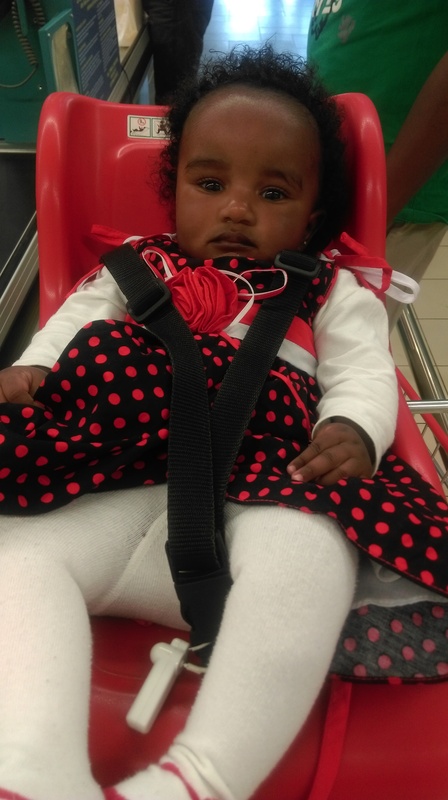 She was in the High Dependency Unit at the Paediatric section, of the Aga Khan Hospital, Nairobi. As we speak almost two weeks later, this young little angel is now well into the road of recovery, with the kicking of her legs and responding to her name, a very emotional and grateful moment. Jena was moved from HDU to the normal ward on Wednesday afternoon. The constant prayers and visits by family and friends has held this family together and given them hope at one of the most difficult times. As Jena continues to recover at the Aga Khan Hospital, there is need to begin to raise funds towards a bill of over Kshs. 700,000. Having seen Jena smile and play, I would like to work towards ensuring that she is able to fully recover and that her parents are able to come out of this challenge victorious. However, they are not able to raise this amount of money, on their own. It is in this regard, that I would like to request for my family, friends and the community at large, to assist me in helping clear baby Jena’s bill. I would like to commit to running of errands, service at an event for both individuals or an organization, any chores, cleaning, planting, whatever is within my capability, that I can be able to do during this Easter season, for any donation that is available to assist my little niece and her parents to walk out of the hospital, hopefully next week, and continue the recovery process at their home. Let us help Jena, her sister Shiru, and her parents, Gerald and Schola continue to live and celebrate her turning one year this April, without this heavy load of Kshs. 700,000 plus on their shoulder. One thing I look forward to. is the day Jena will share her story with the world, of how she truly is a miracle baby, and with the assistance of well wishers, family and friends, she was able to make it out of hospital without owing a single cent. My appeal to Safaricom and Airtel Kenya would be to kindly give us a Paybill number that would enable well wishers to directly transfer funds into. A special thank you to the Doctors and Nurses, at the Aga Khan Hospital in Nairobi, for all their hard work and assistance towards the full recovery of Jena Muthoni. For any clarifications, kindly reach me on 0721415356.